Western Tyres Ltd have regular rounds across the South West. Call 0117 982 3801 Now. We may be in your area today! 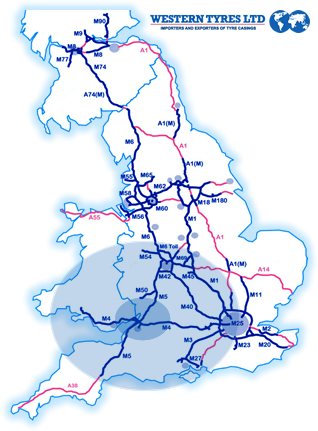 Western Tyres Ltd covers the South West of England, down to Cornwall, Wales, across to Portsmouth and Southampton, and up as far as Gloucester, Swindon, Trowbridge, Melksham, Wiltshire.